Tripp Lite's HDMI Over Dual Cat5 Extender Wallplate Kit is the perfect solution for those who need to extend a HDMI signal over a long distance over two Cat5/6 cables. - When using 24Awg, Solid Wire Cat6 cable, a 1080p (24Hz) or 1080i (60Hz) signal can be extended up to 46 m (150-ft.) from the source. - When using 24Awg, Solid Wire Cat5 cable, a 1080p (24Hz) or 1080i (60Hz) signal can be extended up to 31 m (100-ft.) from the source. 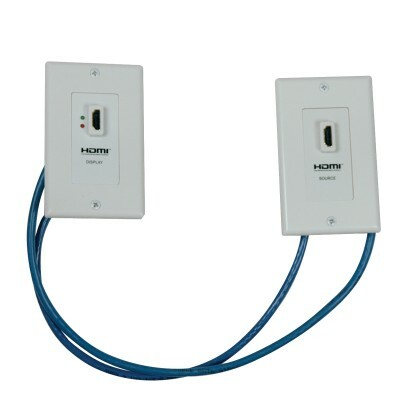 Simply run two Cat5/6 cables between the local transmitter and remote receiver wallplates, and plug in standard Tripp Lite HDMI cables to the HDMI source and the display. The Green LED on the remote receiver wallplate lets you know that power from the source and monitor. When functioning properly, only the Green LED will be lit. If the Red LED is illuminated, it means that the remote receiver is not receiving a functional signal from the source. The P167-000 comes with both local transmitter and remote receiver wallplates. DTS-HD, Dolby True HD and 7.1 Channel Surround Sound audio are supported, and it is compliant with HDCP, EDID and DDC. 24-bit True Color (8-bits per channel) is supported. No external power is required.